Colubraria muricata, copyright G. & Ph. Poppe. The Colubrariidae, dwarf tritons, are a group of small gastropods found in warm, shallow waters. Members of the genus Colubraria lack a radula, though a minute rachiglossate radula is present in members of the genus Metula (Bouchet 1988). Colubraria species use their long and thin proboscis to feed on the blood of resting or slow-moving fish. Characters (from Wilson & Gillett 1971): Shell long, narrow, fusiform, with strong varices, granulose or nodulose sculpture, and usually a calloused and reflected columella. Anterior canal short and up-turned; posterior canal represented by weak notch only at posterior end of aperture. Operculum horny, with terminal nucleus. [B88] Bouchet, P. 1988. 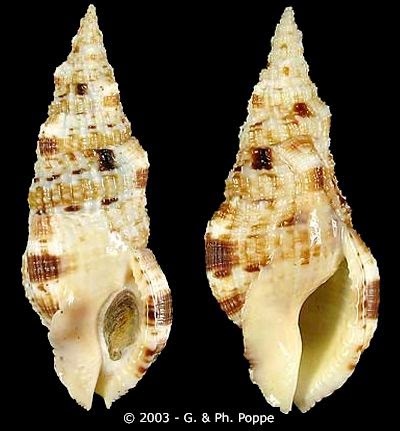 Two new species of Metula (Gastropoda: Buccinidae) with a description of the radula of the genus. Nautilus 102 (4): 149–153.